New Charity Event for Japan! Hang in There Japan! | Beanie Loves Japan! Home > iheartsl, Japan Charity Fundraising Goodies, MV-SL-Fashion, MV-SL-General, second life	> New Charity Event for Japan! Hang in There Japan! 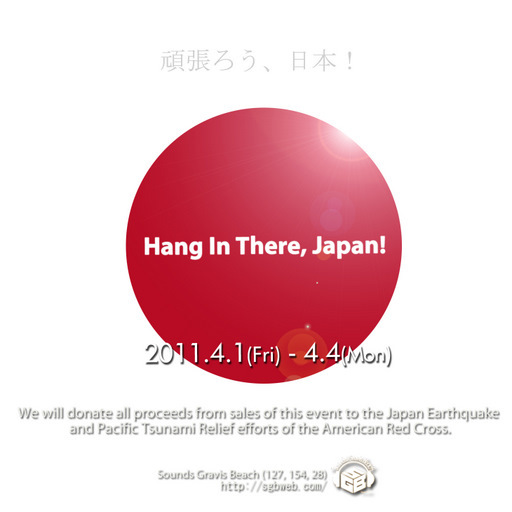 I just found out about this new charity event for Japan at Sounds Gravis Beach (SGB) Resort Mall. It looks like not all the items are out yet, but I’m here buying already lol! There’s a good amount of clothing and hair here for guys too! Japan Charity Item: Anaphora: Hair for Men & Women Shoes, Shoes, Shoes! Free & L$10 a Pair! Shoes, Sandals, & Leather Flip Flops For Guys & Girls!